Impress your guests with the Conservatory Fine Bone China Rim Bowl 28cm. This bone china rim bowl features the timeless architectural motif of the Palladian arch and is a stunning way to serve your favourite soup. Impress your guests with the Conservatory Fine Bone China Rim Bowl 28cm. This bone china rim bowl features the timeless architectural motif of the Palladian arch and is a stunning way to serve your favourite soup. 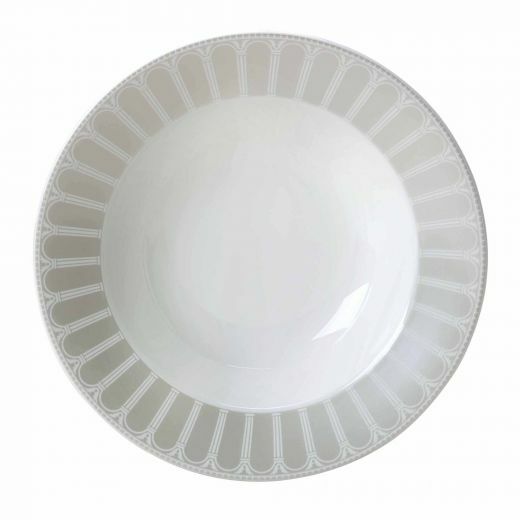 The radiating pattern of this fine bone china bowl will frame your beautiful food and add a touch of classic English design to your dining table. Please note, once your order has been received and payment processed, allow up to 28 days for delivery, although we expect to dispatch most orders within 14 days. We endeavour to get all packages to our customers as soon as possible. For Overseas orders please allow for longer delivery. Please note that once you have received you order, should there be any problems, please contact our office within 7 days on +44(0) 844 854 6673, or reply to the email address shown on your order confirmation.